Foodies and Feline fans, are ready for your Puffed Mice, Spacatti and Moth Balls and a little Catfish Chowder? Well then, Ethel the Gourmet is a work of art for you! Ethel is snuggled in among her forty-plus favorite recipes, spices and snacks. Can you find them all? Are you up for the challenge? If you do, then you’re the Cat’s Meow! This feast for foodies and feline fans has a home in your kitchen. We think you’ll find Ethel the Gourmet the cat’s meow. Order one for yourself and a feline-loving friend before Ethel runs off for good. 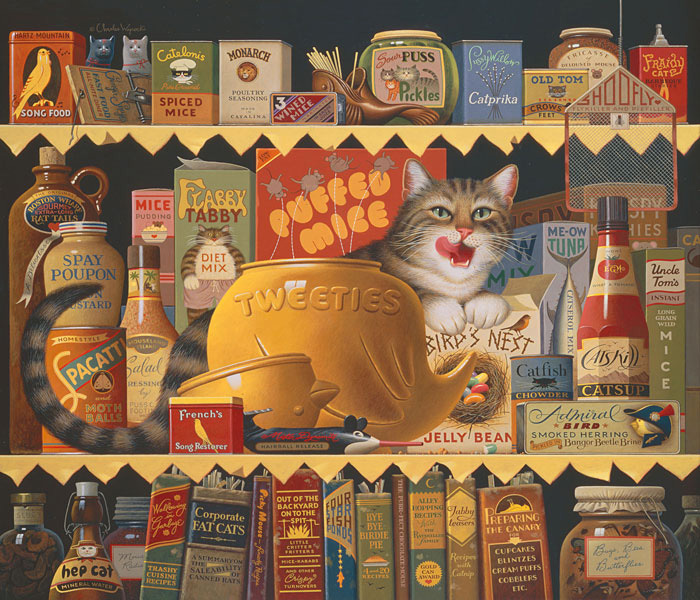 So while Frederick catnaps in his dream den, Ethel reigns over her dream pantry with every cat’s favorite food on the shelves: Puffed Mice cereal, Three Wined Mice Pickled in Grape Juice and Uncle Tom’s Instant Long Grain Wild Mice. And that’s just the rodent menu. Ethel also has fish and birds on the brain with Catfish Chowder and Seasoned Crow’s Feet for starters.